World Usability Day brings together various communities throughout the world to celebrate successful user experience and create awareness about holistic solutions that can lead to a better world. 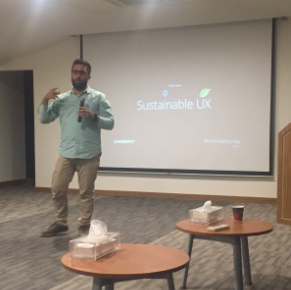 This year, UXBERT proudly represented Saudi Arabia on World Usability Day 2016 by holding a meetup on the topic of Sustainable UX. The number of attendees that showed up (on a Thursday night!) was inspiring. We enjoyed bringing together and meeting talented and passionate personalities who came with open minds and a desire for exchanging knowledge. After a brief introduction of UXBERT by our very own UI/UX Designer Yousef Shanti, we began our presentation on Sustainable [Green] UX led by User Researcher, Linah Aburahmah. The presentation set the tone for sustainability by providing an everyday example of how we are unaware of the waste that is generated by most of us unintentionally. It went on to explain, through digital examples, how sustainability and UX coincide. Ideas of improvements that could be made to reduce harmful effects to our environment were also discussed. We started a debate during the presentation by questioning whether it was more sustainable to develop a website or a mobile app first. The question created space for discussion and the feedback we received was insightful. 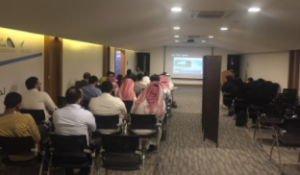 The presentation included suggested tips to support sustainability and questions to raise when developing a product to ensure that excellent products are delivered and environmentally-friendly choices are made. Ten minutes later, our Twitter account was flooded with awesome ideas for local improvements. We carried out an audience voting to determine the winner of our challenge – Abdulla Alhazmy (@alhazmy13) whose innovative idea won him the book Usable Usability: Simple Steps for Making Stuff Better by Eric Reiss. The meetup was an absolute success. It generated interesting discussions and a wealth of knowledge on how to improve designs while reducing waste. You really had to be there to enjoy the experience! Slides from the presentation can be found below. Make sure you don’t miss out on future meetups by joining our User Experience & Design group on Meetup.com. A special thank you to the team at Badir Program for Technology Incubators for hosting us in their home, and a huge thank you to everyone who showed up and shared their UX spirit with us. We look forward to seeing you all again in our upcoming meetups! People shouldn’t have to put up with products and services that don’t work and frustrate. Every second someone browses a simple web site, roughly 20 milligrams of CO2 are generated. Talk about sustainability issues and integrate solutions to them in your everyday life. Think about what impact everything you design would have if 10 million people would use it. Challenge a person who is interviewed for a product-related position with a better-sustainability question.